Qmpeople is an interactive chat site that's free to use. Members can use online messaging, access games, chat rooms, and discuss places and specific topics using the sites applications. There's also an SMS service that lets you receive messages directly on your cell phone. Qmpeople.com just might be the simplest chat site for meeting new people ever created. It allows members immediate access to a message service, chat room and forum where single men and women can go to meet others for friendship and romance. Plus, by providing your cell phone number to the site, you can SMS each other people without having to give up personal information such as name or phone number. The site's color scheme and graphics are simple but not tacky, making it very easy and pleasant to navigate. Filling out a profile requires little effort and allows members to upload four pictures at a time. This is a small, fun site. You probably won't meet your next spouse there but it's worth a look. They've reinvented themselves several times over the years. Qmpeople.com is the English version of the original Italian website, it.qmpeople.com. It's billed as a venue for meeting new friends and keeping track of old ones. Members can meet in the arena to be voted most beautiful, funny or handsome. The site requires that members have at least one photo uploaded on their profile before being allowed to use the SMS feature. Rss Feeds. Subscribe to comments for this site. [?] Receive updates about Qmpeople.com directly through your newsreader. Hi! Looking for a good looking man from america just for chatting. Qmpeople.com 5 1 A review of Qmpeople.com. 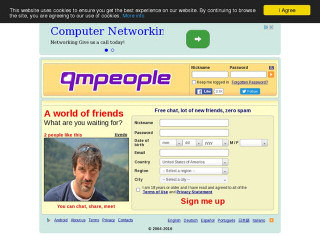 Qmpeople is an interactive chat site that's free to use. Members can use online messaging, access games, chat rooms, and discuss places and specific topics using the sites applications.